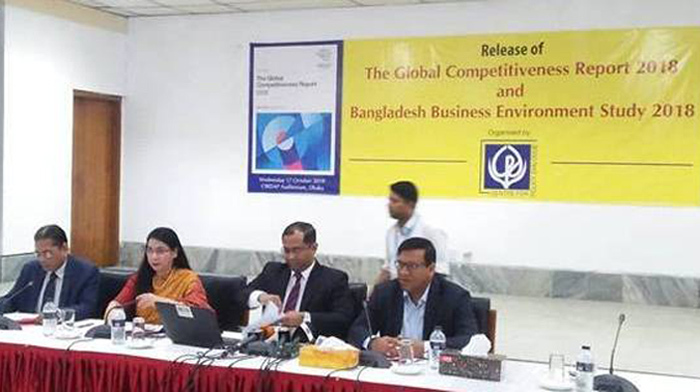 Bangladesh slipped down to 103rd position among 140 countries from 102th in last year in Global Competitiveness Index 2018 released by World Economic Forum (WEF) though its overall score increased by 0.7 percentage points this year. Bangladesh’s competitiveness has been weakened in most of the indicators (both in rank and score). Among 12 pillars of this survey, Bangladesh ranked below 50 in one pillar on Market Size (36th). Bangladesh ranked between 80 to100 in two other pillars on Macroeconomic Stability (88th) and Health (96th), said the report. Centre for Policy Dialogue (CPD), the local partner of WEF, released the report at a press briefing at CIRDAP auditorium in Dhaka. Bangladesh is partially better in terms of Macroeconomic Stability, Health and ICT adoption and far behind in terms of Business Dynamism and Institutions compared to other developing countries of South Asia, the report said. Corruption remained at the top of the problematic factors in doing business in Bangladesh, which was also at the same position in last year’s index. Inadequate infrastructure and inefficient government bureaucracy are also major obstacles, it added. “The country's rank slipped down as other competitive countries achieved improvement at faster rate, said CPD Distinguished Fellow Professor Mustafizur Rahman. Meanwhile, USA ranked top in the 2018 GCI followed by Singapore, Germany and Switzerland respectively 2nd, 3rd and 4rth without any change with that in 2017, revealed the report. Among the South Asian countries, India gained by advancing five positions (58th), in GCI 2018. Bangladesh (103), Pakistan (107) and Nepal (109) slipped by one position each and Sri Lanka by four positions (85). CPD Executive Director Fahmida Khatun and Research Director Dr Khondaker Golam Moazzem also spoke at the programme.